I was so excited to be at Road Atlanta! It a challenging track with little room for mistakes. During practice runs I noticed that I had a hard time with the last turn again. I was nervous because I was on less sticky tires and no front splitter. I was struggling on the first day to beat a 1:47. Last year I had a 1:46 with my car set up differently. This year I added about 50 whp and switch over to Fortune Auto coilovers, I was determined to beat my time. My times were getting worse as the day went on! Which placed me in 3rd. Later that night I changed my oil because it was time and RV parks don't like it when you work on cars on their property. 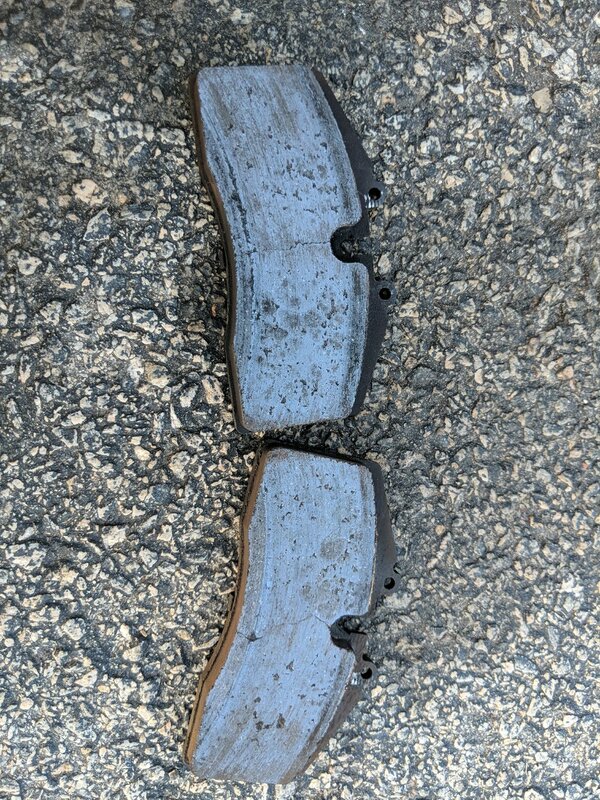 As I was changing my oil I saw that I was getting a little bit of brake pad transfer on the front brakes. This meant my pads could not keep up heatwise, the R1 pads only go up to 1000 F. It definitely was getting hotter than that because of the back straight I'm going 120 mph then have to break it down hard. I thought to myself I bet this is why I can't beat my time. I had to a plan to eat up time by braking later on the straights. So I changed out my R1 Concepts Street Series pads to my Hawk DTC-60s. 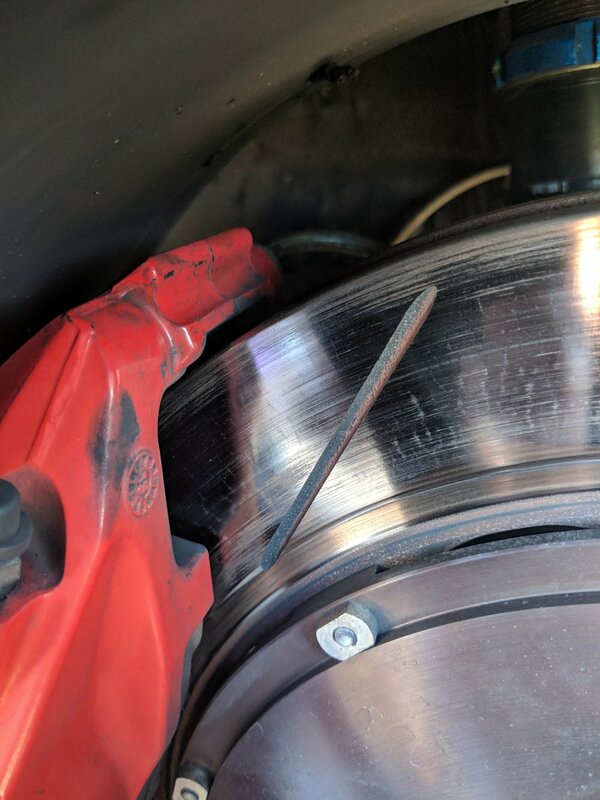 The rear pads were complete fine since they are not doing too much work. The next day the race started sooner which meant it was cooler. This means my car was going to perform a lot better. It LOVES the cold, it keeps the turbo cooler creating better boost. On the first lap out I worked up to braking later on turn 6 and 10 A. As I was flying around the track I caught up to a heavily modified white Miata. Who was just as fast as I was on corners. To my surprise I had more top end speed than him on the straights. It's very rare for my car to beat another car on the straights. Then I see my competitor who was in 2nd place. A black Mercedes AMG C43. It took me about 2-3 laps to finally catch up to him and pass him. I knew that I must of beat his time by at least a second. After I pass him and I'm heading down the big straight I get a meatball flag waved at me. Which means mechanical failure. I didn't notice anything wrong with my car but seeing how I was about to go down the dangerous corner I thought best to get off the track. Then I noticed other cars getting off track too. With only 5 mins left of the session I was not allowed to go back on track. I was so pissed I was running good. And I knew it was going to be about 93 F later in the day, my car would not be any faster in the afternoon. I found out the corner worker incorrectly flagged me. Although they will not admit it. They said they were flagging a black Camaro. And just kept using that same excuse. That Camaro was about 3 turns behind me. I could definitely tell it has a mechanical failure because of how slow they were going. I think they probably got my car confused with mine,. I was shocked to find that I improved my time by 3 secs and beat my personal best by 2 secs! I got a 1:44:757 placing me in 2nd place! I beat the Mercedes by a whole 2 seconds! Unfortunately I could not beat 1st place. Looking at what was under the hood of that Evo, it must of been pushing about 450 hp. I'm only running 288 whp on a mustang dyno, but I do my best with what I have. Here's the video of my fastest time! I can't wait to come back next year to beat my time again! If you like my blog posts and want to be the first to read it, please join my newsletter mailing list. Also you'll get updates on sales, new products, and special birthday discounts! Please help support a dream visit, my shop to get Racing Chica merch. Earnings go towards the car, fuel, entry fees, and creating visibility for women and women of color. I am so honored that Sam Parker from Badassery Magazine asked me to be a contributor! If you haven't heard of about Badassery Magazine I'll tell you about them. It's an awesome magazine featuring badass women succeeding in their industry. These women are making waves, breaking stereotypes, and making a difference. Check out the lessons in full detail in the digital magazine link below, page 39. I am so honored to be interviewed by Fox 13 news. I love how they represented my mission and brand and that is to inspire other women to thrive in male-dominated industries like Motorsports. Check out the interview.